22.5Lx13Wx3H - A stunning custom designed large skillion shed, featuring custom horizontal cladding in COLORBOND™ "Shale Grey"
Custom designed 15Lx9Wx3.9H skillion shed, built by Shed Boss Fleurieu. Featuring COLORBOND® Woodland Grey®, with contrasting horizontal clad Zincalume® to the front of the shed. The skillion roof is pitched at 10 degrees, giving an overall building height of 5.4m, allowing plenty of room for an internal mezzanine. 12.9Lx12Wx3.4H - Skillion shed, with 3.5 degree pitched roof. Featuring COLORBOND™ Surfmist and roof, 3m high x 3.3m wide roller doors, heavy duty personal access door and 1800mm high x 535mm wide bottom awning windows. Shed Boss Skillion 9Lx6.5Wx2.7H - With 5 degree pitched roof. 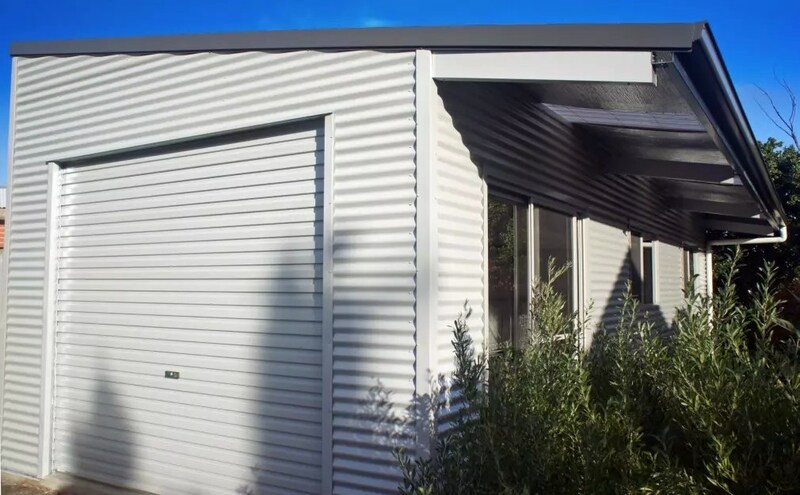 Featuring COLORBOND™ Monument roof and trim, with Windspray walls, windows and roller door. 9Lx6Wx2.4H - Skillion shed featuring horizontal cladding and custom eve overhang. 9Lx6Wx2.7H - Skillion shed, with 5 degree pitched roof. Featuring COLORBOND™ Woodland Grey walls and roof, 2.7H x 2.7W roller doors and a heavy duty personal access door. Skililion shed with 15 degree pitched roof, with front awning. 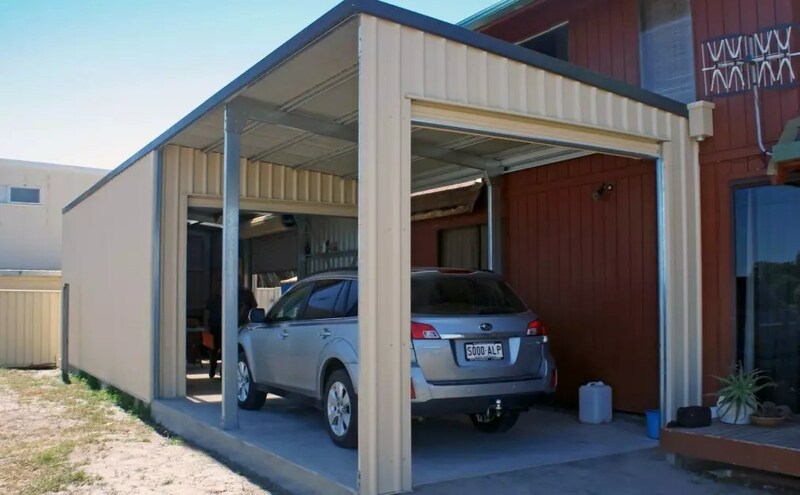 Featuring COLORBOND "Paperbark"
The skillion roof, also known as a mono-pitched roof, is one that only slants at one angle, another option to provide angle cover so elements can slide off easily. It is a common roof for our sheds, and for this reason is often referred to as simply a ‘shed roof’. This option also has the standard four walls to begin with, and provides a great shelter option. 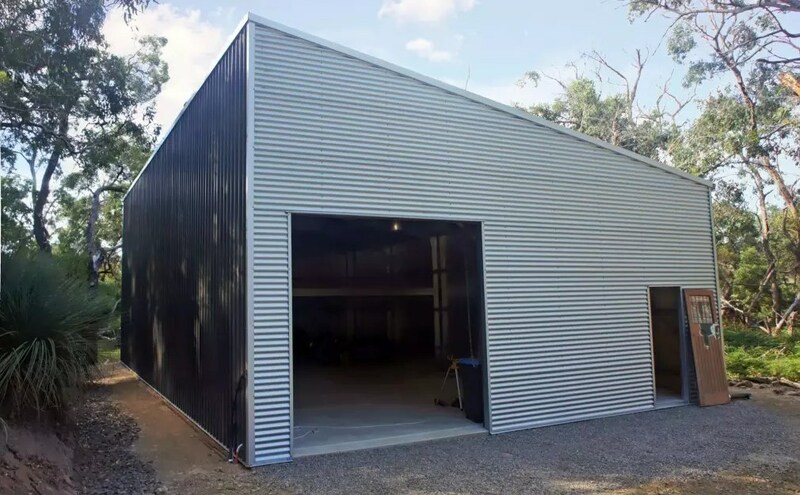 One of the great things about a Shed Boss shed, or any other one of our structures including garages and workshops, is that they can all be custom designed to your preferences. This means you can pick a roof shape, style and material that best suits your needs. A skillion roof may be exactly what you're after, especially because it is so versatile. What is a skillion roof? Also called a mono-pitched roof or a 'shed roof' by Aussies, a skillion roof only slants to one side. On the other hand, a hip roof or gable roof has at least two sloping sides, which meet towards the centre in a ridge. Why install a skillion roof? There are both practical and financial perks to a skillion roof. Their mono-pitched shape means that they have fewer drainage problems compared to less steeply pitched roofs. Because this style is easy and fast to construct, it is a cost-effective way to build. It's roof profile can be also be used with most shed or garage designs, offering versatility. At Shed Boss, we use our industry-leading Morinda™ Glove Section Bracket System to engineer the skillion roof pitch so it can vary from 3.5 to 10+ degrees. This flexibility gives you freedom to pick an angle custom to your needs, all the while offering a sophisticated, seamless design. This is why the skillion roof is an ideal choice for a contemporary, industrial-chic styled residential shed. Indeed, the skillion roof has gained popularity in Australia as a design feature in its own right, evoking rural and industrial themes. Our new architectural skillion range is available in a wide range of COLORBOND® steel colours, and the flat angled roof shape gives it a very stylish, edgy look that is a better match to modern houses. A higher clearance can be achieved. Versatile, custom & modern designs can be freestanding, or attached to an existing building. Skillion roofs can be placed specifically to benefit from solar loading for solar panels. 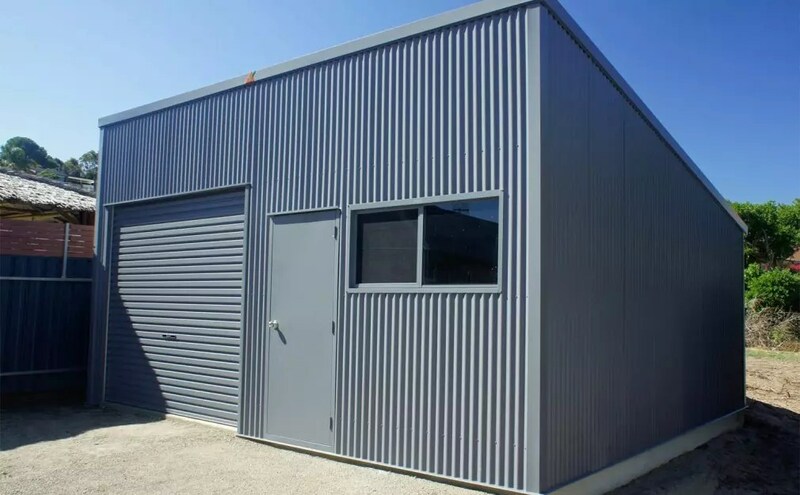 The team at Shed Boss Fleurieu will guide you through our wide range of designs to custom build a skillion shed that suits your individual space and price needs, while meeting Australian Standards and Council Regulations. 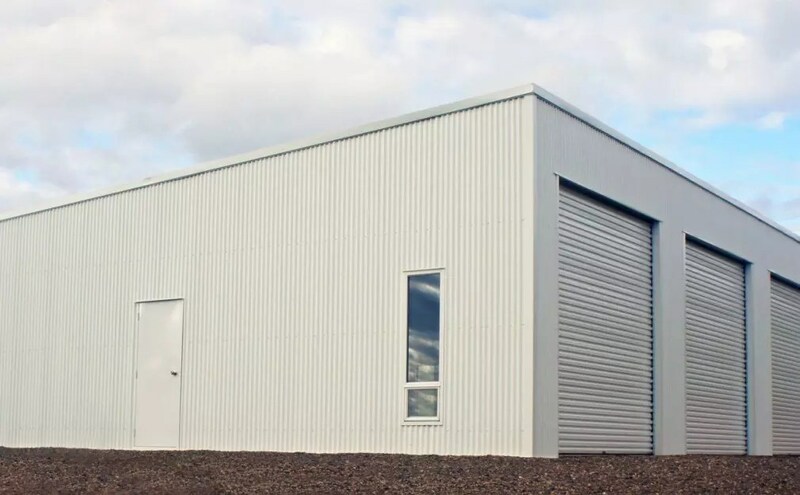 We can have your skillion shed delivered in kit-form to erect yourself, or leave the hard work to us and we will manage your project from start to finish to the highest standards. 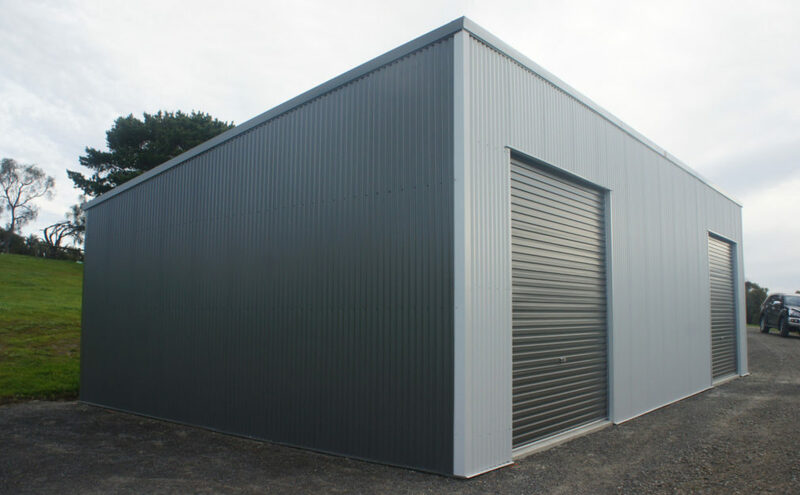 For further information, talk to the shed building professionals at Shed Boss Fleurieu or contact us today to discuss your design. 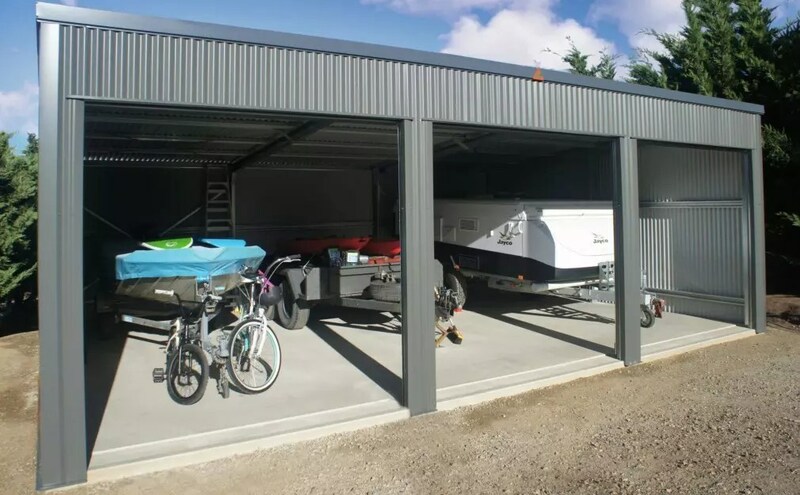 Shed Boss Skillion Shed 22.5Lx13Wx3H The roller doors in this Skillion shed are each 3.6 metres high x 4 metres wide, plenty of room for the caravan or boat. Shed Boss Skillion Shed 22.5Lx13Wx3H The Personal Access Door on the far left of this skillion shed allows quick entry. 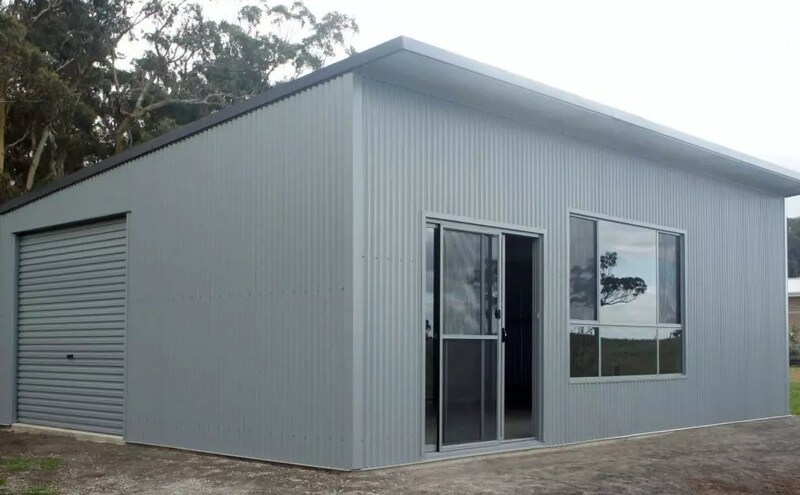 Shed Boss Skillion Shed 9Lx4.6Wx2.4H This skillion shed has a 2.1 metre high x 2.4 metre wide roller, with COLORBOND "Sufrmist" walls and "Woodland Grey" roof, trim and roller door. Opposing Skillion Roof Shed Another example of a customised design for our client that wanted something different, and chose Shed Boss Fleurieu for the complete project. This stylish skillion shed features opposing pitched 10 degrees and 5 degrees) roofs with 600mm eve overhangs. A multi-purpose and versatile COLORBOND building awarded "Best Custom Design 2012-13"
Opposing Skillion Roof Shed This skillion shed looks stunning with a COLORBOND colour scheme of "Shale Grey" for the corrugated roof, trim and roller doors and "Woodland Grey" for the corrugated walls. 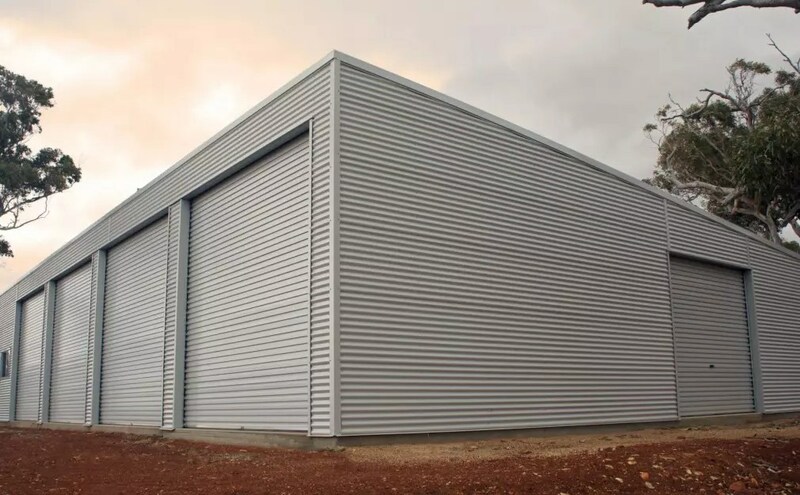 The roller door is 2.4 metres high x 2.7 metres wide. Opposing Skillion Roof Shed Extend your indoors outdoors with our range of glass sliding doors, which can make your shed space flexible and adaptable to your lifestyle. No longer is your shed "just a shed", it can also double as an entertaining space, or even a studio. On the low side of this custom designed skillion shed are 2 glass sliding doors, each 2.1 metres high x 1.8 metres wide. Opposing Skillion Roof Shed Internally, there's plenty of storage space plus room for entertaining. Skililion shed with 15 degree pitched roof, with front awning. Featuring COLORBOND "Paperbark" This project was custom designed to optimise solar panel performance, with a 15 degree pitched roof. The overall height is 4.76m, with a height of 3m to the low side of the enclosed skillion shed. Skililion shed with 15 degree pitched roof, with front awning. 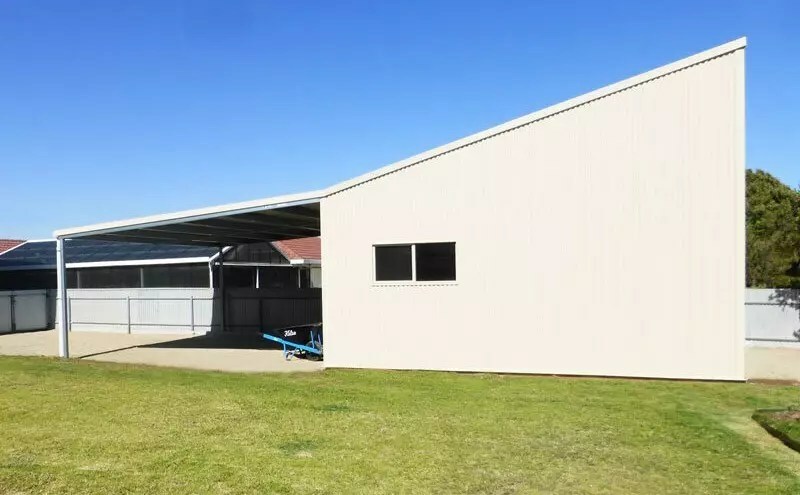 Featuring COLORBOND The awning attached to the front of this skillion shed is 6m x 6m. 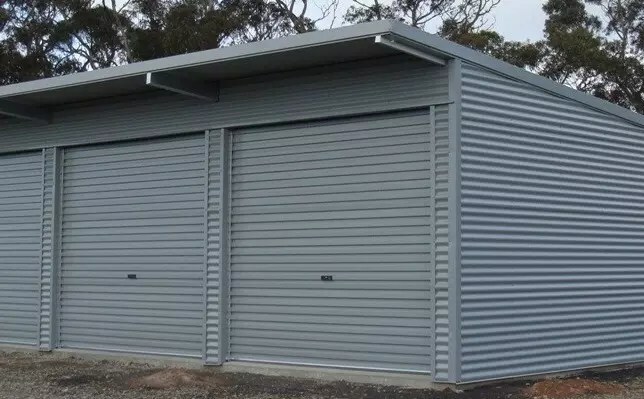 9Lx6Wx2.7H - Skillion shed Featuring COLORBOND™ Woodland Grey walls and roof, double entry roller doors (each 2.7H x 2.7W), and a commercial heavy duty personal access door. 12.9Lx12Wx3.4H - Skillion shed 12.9Lx12Wx3.4H - Skillion shed, with 3.5 degree pitched roof. Featuring COLORBOND™ Surfmist and roof, 3m high x 3.3m wide roller doors, heavy duty personal access door and 1800mm high x 535mm wide bottom awning windows. 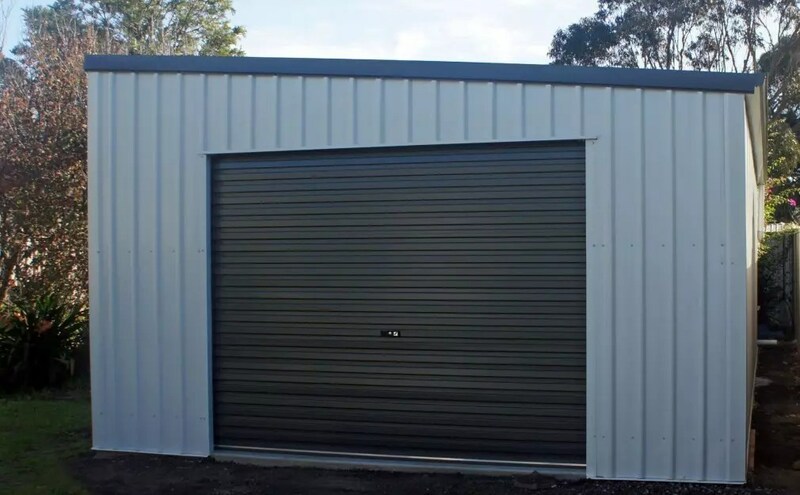 Shed Boss Skillion 9.876Lx3.145Wx2.7H One of the benefits of the custom design offered by ShedBoss, is that we can achieve exact measurements to make the most of the available space on your property. Shed Boss Skillion 9.876Lx3.145Wx2.7H This custom skillion shed features COLORBOND™ Surfmist roof and trim; with Dune walls. For the panel lift door, the premium timber look finish add a premium, yet natural feel to the garage door. Made from BlueScope steel, this is a more affordable alternative to real timber, with no resealing or ongoing maintenance required. 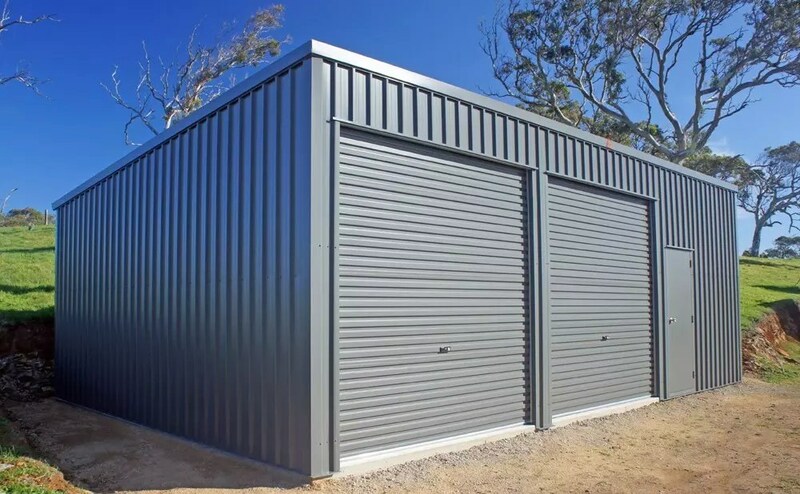 9Lx6.5Wx2.7H This skillion shed features COLORBOND™ Monument roof and trim, with Windspray walls, roller door and windows. At Shed Boss, we use our industry-leading Morinda™ Glove Section Bracket System to engineer the skillion roof pitch so it can vary from 3.5 to 10 degrees. This flexibility gives you freedom to pick an angle custom to your needs, all the while offering a sophisticated, seamless design. 9Lx6.5Wx2.7H The skillion roof is an ideal choice for a contemporary, industrial-chic styled residential shed. Indeed, the skillion roof has gained popularity in Australia as a design feature in its own right, evoking rural and industrial themes. 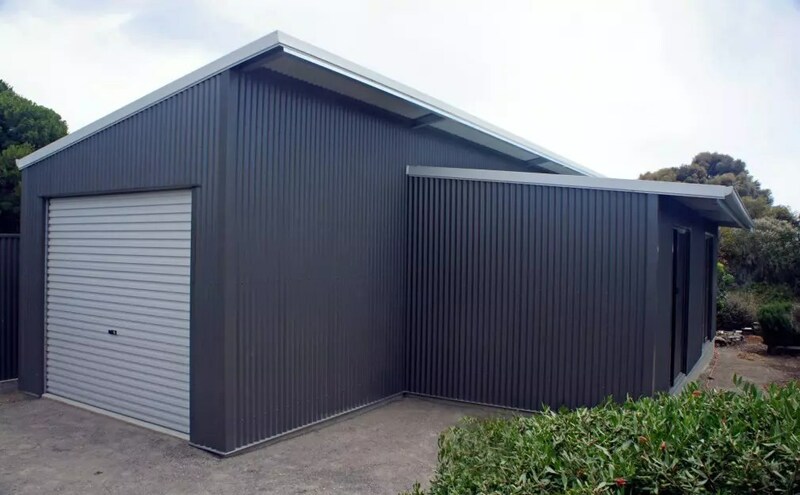 Our new architectural skillion range is available in a wide range of COLORBOND® steel colours, and the flat angled roof shape gives it a very stylish, edgy look that is a better match to modern houses. What kind of shed suits your needs?